The Eiffel Tower has long been an icon of Paris and one of the first things that come to mind when people think of the city (even France). I can’t imagine making a trip to Paris and not seeing the Eiffel Tower! You might think that the Eiffel Tower’s popularity makes it a “touristy” attraction, but it really is not. To me the word touristy implies something that lacks authenticity, is tacky and surrounded by people selling cheap junk. The Eiffel Tower is not like that at all. First of all, it was built by a prominent French architect and engineer in celebration of an important time in France’s history- that’s keeping things pretty authentic. It is not surrounded by hordes of vendors trying to sell you souvenirs and the increased police presence since I was last there in 1998, meant that we didn’t see any obvious scam artists either. Sure, it may be tempting to turn your nose up and think, “Look at all those silly tourists. Standing in line forever, taking the same picture that’s been taken thousands of times.” The bottom line is, certain sites are popular for a reason. There are some places, as cliché as it sounds, that are “must sees” when visiting a city. The Eiffel Tower is one of them. All that aside, we loved our visit to the Eiffel Tower! It’s an amazing structure that’s beautiful to look at night and day, near and far. Even though this was my second time seeing the tower, it still took my breath away when it first came into view. In fact, the first batch of photos I took of it are blurry because I was shaking from excitement! Touristy or not, a visit to Paris would not be complete without feasting your eyes on the world’s most recognized structure. 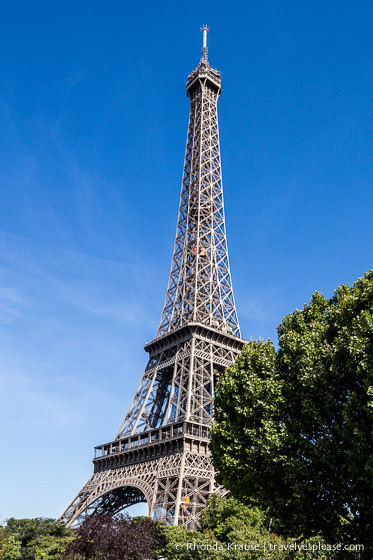 The tower was built by French architect and engineer Gustave Eiffel (who also designed the Statue of Liberty) in 1889. It was constructed for the Exposition Universelle, celebrating 100 years since the French Revolution. Eiffel was granted 1.5 million francs to pay for construction costs that were estimated to be 6.5 million francs. Eiffel was also promised all income from the tower during the exposition and for 20 years afterwards. The lifts were not yet completed when the tower opened nine days after the exposition began. By the end of the exposition, there had been almost two million visitors. The tower was only supposed to stand for 20 years. When the agreement with Eiffel ended, ownership of the tower would revert to the City of Paris and the plan was to have it dismantled. It was kept because of it’s valuable communication purposes (radio transmission, then telecommunications). The Eiffel Tower was the tallest man made structure in the world for over 40 years. It lost this title in 1930 when the Chrysler Building in New York City was completed. There are 72 names of French scientists, mathematicians and engineers engraved on the tower recognizing their contributions. The Eiffel tower took two years, two months and 5 days to build. It is 324 metres tall, including its antennas. There are 120 antennas on the tower. 7,300 tonnes of metallic framework make up the tower, with a total weight of 10,100 tonnes. There are 1,665 steps to the top, on the East staircase. Every seven years the tower is repainted, requiring 60 tonnes of paint. 336 projectors are used to illuminate the tower at night. 20,000 bulbs glitter for five minutes at the top of the hour, from nightfall until 1:00 am. Almost 7 million people visit the Eiffel Tower every year, making it the most visited monument that you have to pay for in the world. 75% of all visitors to the tower are foreign to France. The sweeping views from the top of the Eiffel Tower will leave you speechless! You can see every famous monument- the Arc de Triomphe, Les Invalides, Notre Dame, and Sacre Coeur. It was a great idea to go to the Eiffel Tower before we visited anywhere else because we were able to get orientated and landmark the city. We spent so much time at the top simply standing in awe of the wonderful city before us! – 9:00 a.m. to midnight from June 21 to the September 2. – 9:30 a.m. to 11 p.m. during the rest of the year. – On Easter weekend and during the Spring holidays opening hours are extended to midnight. Admission to the Eiffel Tower varies according to which floor you want to visit. It’s €16.30 to take the lift to the second floor and €25.50 to the top. Take the stairs to save money and time waiting in line. It’s €10.20 to take the stairs to the second floor. From there you can buy a ticket for the lift to the top. A combination ticket for stairs plus lift from the 2nd floor is €19.40. You can also buy your tickets for the elevators on line through the Official Eiffel Tower Ticket Office. The online tickets often sell out way in advance but don’t worry, there still will be tickets available at the tower when you arrive. Make sure you don’t miss the Eiffel Tower sparkle at night! It was the highlight of our trip and one of the most romantic things to do in Paris. You can catch the “show” at the top of every hour after nightfall until 1:00 am. The tower glitters for five minutes. 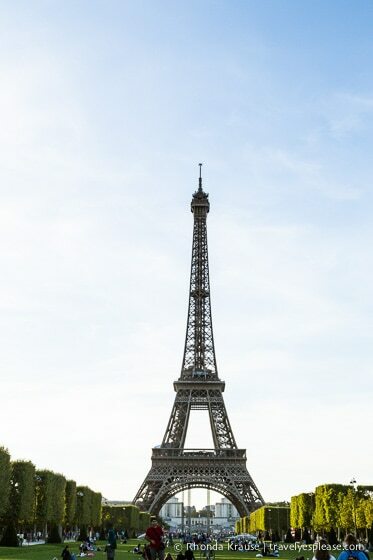 To search for hotels near the Eiffel Tower, please visit Booking.com, our trusted booking site that we use for all our trips. Accommodations booked through the included link earn us a small commission, at no extra cost to you, and help support this website. Thank you! * Prices and hours were updated Feb. 1, 2019, but can change without notice. Please confirm directly with service providers.